I gave this presentation at the recent EDS Conference in Liverpool. EDS stands for EBSCO Discovery System, a type of resource discovery interface which allows users to explore a whole library collection from a single search page, rather than multiple catalogues (e.g. for books, e-resources, and special collections). Find out more about the EDS Conference on the conference site, and from Emma Coonan‘s Storify summary. 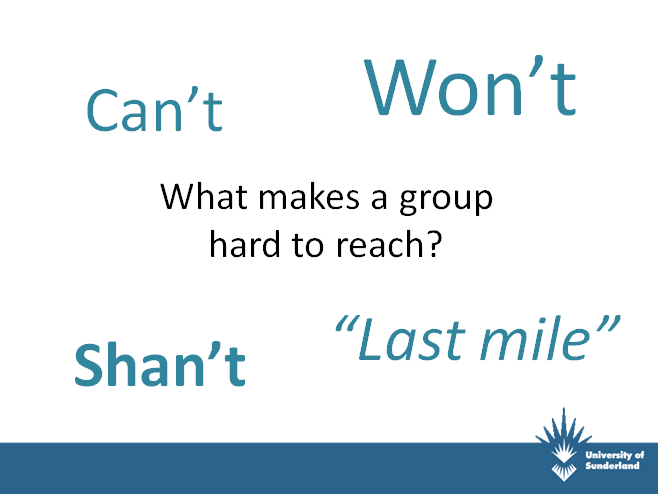 What makes a group hard to reach? Last mile, or the last 10%, or the high-hanging fruit – law of diminishing returns. It’s hard to get everyone on board. Give yourself a break about this group – you can’t force them; you can only provide opportunities for them to engage. 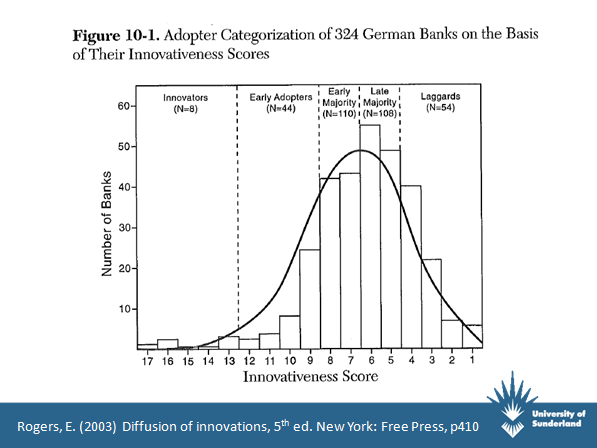 Source: Rogers, E. (2003) Diffusion of innovations, 5th ed. New York: Free Press, p410. 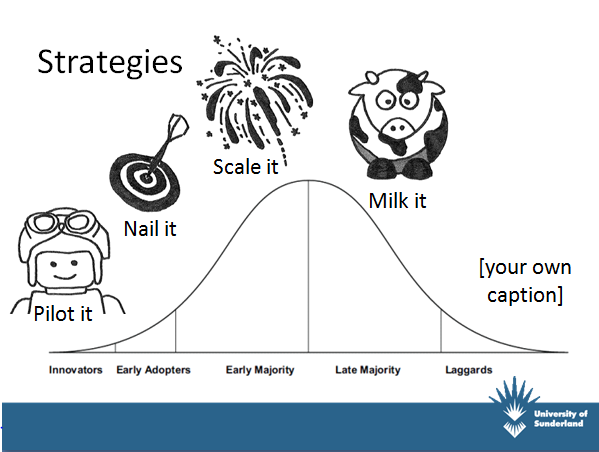 The adoption curve is often applied to technology, but applies to all change. People respond to innovations in very different ways. Rogers groups these behaviours as innovators, early adopters, early majority, late majority, and laggards. 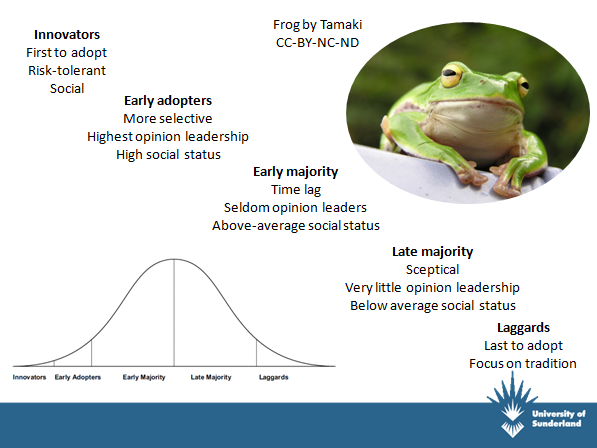 Early adopters – more selective, highest opinion leadership, and highest social status. These are the people with influence, not the innovators. Early majority – after a slow start, the innovation is taking hold once this group are on board. They are seldom opinion leaders, but have above-average social status. Late majority – a sceptical group, with little opinion leadership, and below-average social status. Laggards – these are the last to adopt, as they treasure tradition. Also – leapfroggers! When former resistors upgrade, they will often need to skip several generations in order to reach the most recent technologies. Maybe you know someone who has never had a home computer, but has a tablet. Another example is telephone networks in rural areas – landlines were too expensive to set up, but once mobile phones and better reception became commonplace, such communities went directly to having mobile phones, skipping over the landline stage. Use different approaches, and with different groups of people, as the implementation of your resource discovery tool progresses. Pilot it with the innovators – these people will enjoy testing the system, and will perceive bugs or gaps as challenges to overcome, rather than as flaws of the system. Nail it with the influencers, whose buy-in you need in order to bring the early majority on board. This is a time for final tweaks only; the system itself must be reliable by this point. Scale it with the early majority, and milk it with the late majority. Do what you can for the laggards, and don’t be too hard on yourself and your marketing efforts if they refuse to join in. Although the resistance of the laggards is an obvious obstacle, the late majority can also be a difficult group to win over because they tend to be sceptical. Continuity makes people feel secure (especially in academia), and the late majority may feel stressed if they can see that those around them have adapted and they haven’t. Furthermore, if they took an entrenched negative view early on, it will be hard for them to change their minds and come on board. Tailor-made marketing messages are essential for spreading awareness of and engagement with your new discovery tool. For whom? Consider your audience. Different messages for different users. Are you communicating with new students, returning students, academic staff, library staff, other groups? What? Sometimes the core message is enough; others may need more detailed or more technical information. Pitch your message according to how much your target group need to know. For academics, use flattery – a key academic liaison technique! This could involve making it clear that interface is primarily for students, or aiming high with detail in the hope that 10% might be retained. Academics are impressed by someone who knows details, even if they don’t understand them. How? Recycle and repackage your messages. Use a variety of methods: live presentations, demos, leaflets, videos, screenshots, handouts, webpages – different media appeal to different people. 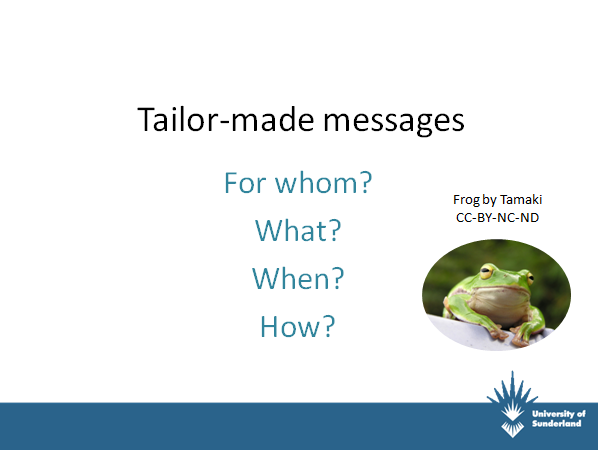 Don’t give up hope with laggards – one of them may be a leapfrogger! If you have an academic who resisted the shift from print to electronic journals, a new tool could provide a way for them to appreciate the flexibility of e-journals from a different perspective. 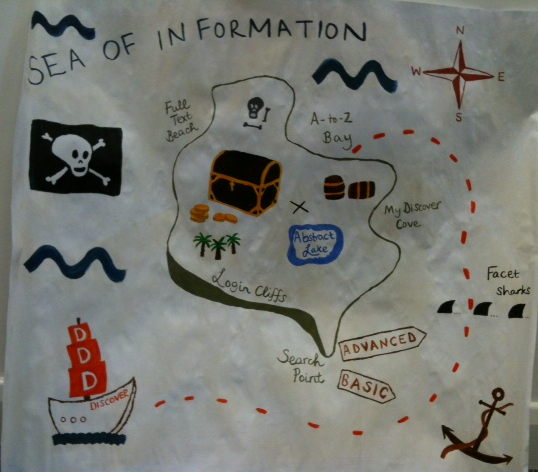 Board the good ship Discover as you embark on your voyage across the Sea of Information! 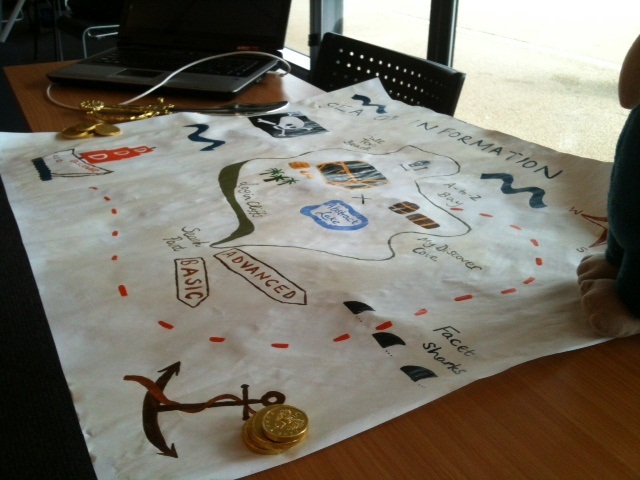 As ye set sail on the Sea of Information, trust not the shoddy raft of Google for yer academic research. Rather, board the good ship Discover and I’ll see yer safely through the choppy waters. Beware the Login Cliffs, the steepest face of the paywall coast of the Island of Knowledge. I’ll see you safely past, with Single Sign-On. As we reach Search Point, you must choose between the Basic or Advanced route. Use the Facet Sharks to narrow down your search results. If the wind is rising and you need to take cover, rest awhile at MyDiscover Cove, a folder where you can store your search results for future reference. Carry on to A-to-Z Bay to go directly to the resource or platform you need, or head straight for Full Text Beach. 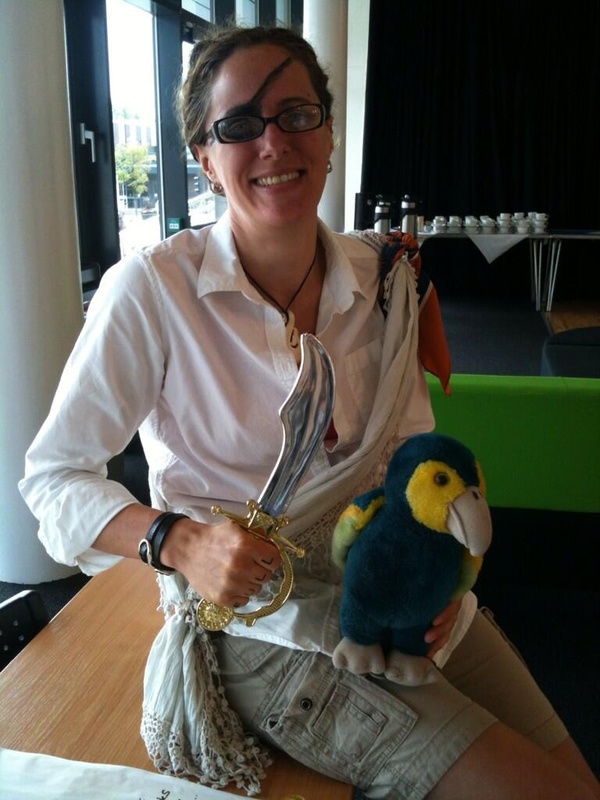 Beware the Data Pirates, a lawless bunch with scant respect for copyright, or the terms and conditions of our e-resources licenses.